The morning of FamilyFarmed‘s Good Food Financing & Innovation Conference Thursday — the first day of the three-day, 12th annual Good Food Festival & Conference — was packed with content, entrepreneurial vision, and inspiration to accelerate the growth of the fast-rising Good Food movement. The following photo essay provides a glimpse of the activities that got FamilyFarmed’s big yearly event off to a running start. Thursday’s program continues into late afternoon with a Financing Fair, at which promising Good Food businesses have the opportunity to meet buyers and investors, and more great, expertise-packed panels. The event continues Friday with the Good Food Trade Show & Industry Conference (click here for details) and Saturday with the Good Food Festival, our big publication celebration of a better food system (click here and here and here for details). 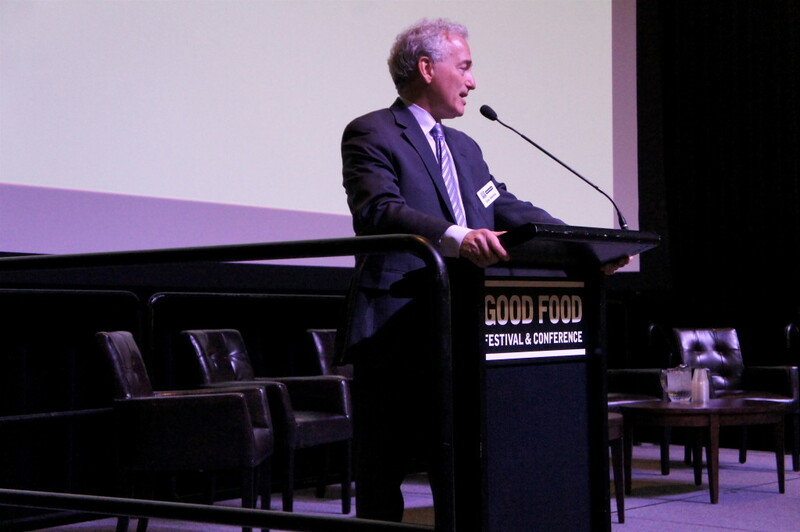 FamilyFarmed President Jim Slama welcome attendees to Thursday’s Good Food Financing & Innovation Conference, the opening day of the three-day Good Food Festival & Conference at Chicago’s UIC Forum. 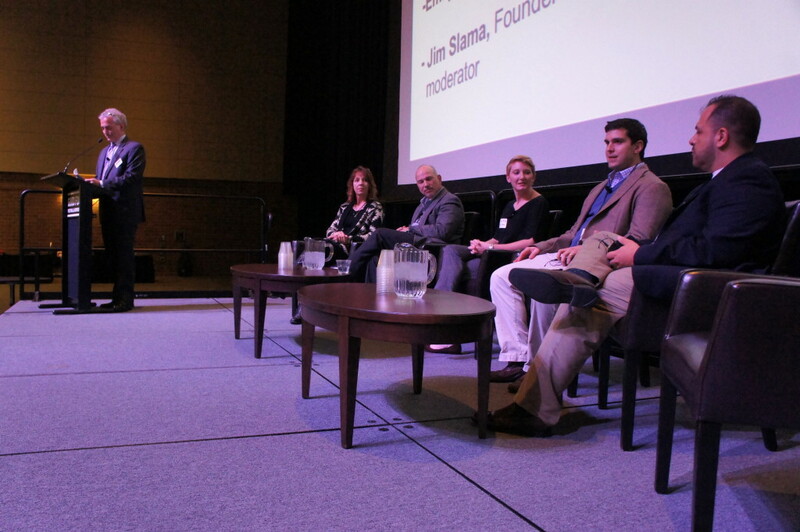 U.S. Secretary of Agriculture Tom Vilsack addressed FamilyFarmed’s Good Food Financing & Innovation Conference Thursday, detailing the wide and growing variety of programs that benefit local food systems, small and medium-sized farms, new and beginning farmers, farmers markets, and more. 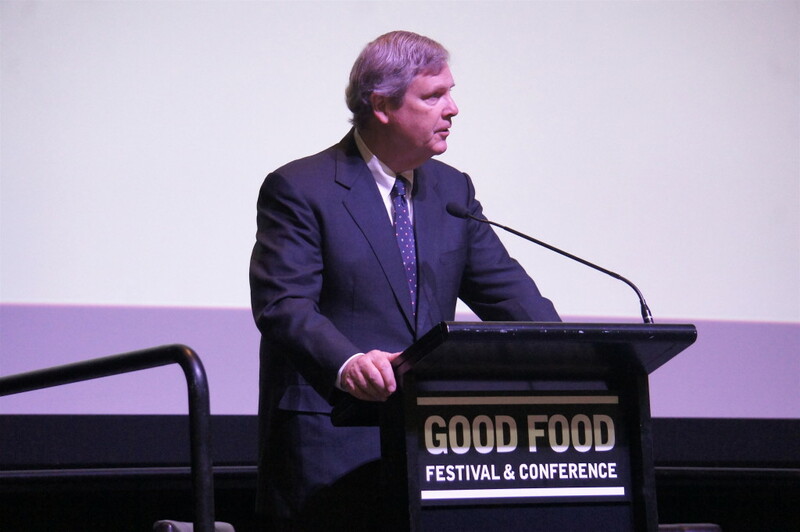 Vilsack — who announced the release of an Economics of Local Food Systems Toolkit by the USDA’s Agricultural Marketing Service — is the first Cabinet member to address the 12-year-old Good Food Festival & Conference. Agriculture Secretary Tom Vilsack’s remarks on Good Food public policy were expanded upon in a following panel featuring USDA officials: (from right) Sam Rikkers, administrator of USDA Rural Development; Michael Alston, associate administrator, USDA Risk Management Agency; and Sara Eckhouse, chief of staff of the USDA Agriculture Marketing Service. 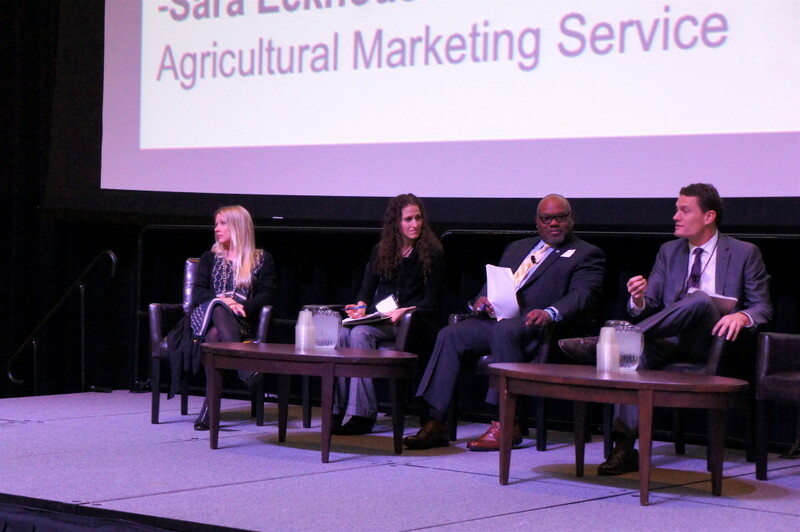 The panel was introduced by Marianne Markowitz (left), Midwest region adminstrator for the U.S. Small Business Administration. At the Opening Symposium at Thursday’s Good Food Financing & Innovation Conference, FamilyFarmed President Jim Slama (at podium) discusses a range of Good Food issues with expert panel that included Michael Bashaw, Midwest president for Whole Foods Market; George Siemon, CEO of Organic Valley, a leading marketer of organic dairy and produce; David Miller, CEO of Iroquois Valley Farms, which invests in farmland and rents it to family farmers who convert it to organic standards; Raj Karmani, founder and chief impact officer of Chicago-based Zero Percent, which fights food waste by connecting businesses that have surplus food with nonprofits that provide assistance to the needy; and Danielle Gould, CEO of the business-oriented Food + Tech Connect website. Bashaw revealed that Whole Foods Market will open its heavily anticipated new store in the economically challenged Englewood neighborhood on Chicago’s South Side on Sept. 28. 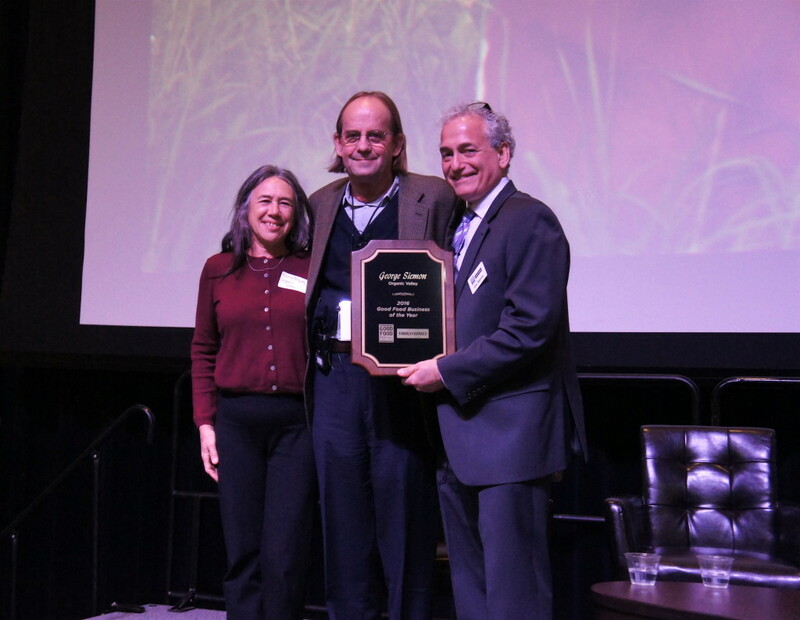 George Siemon, who calls himself the “CIEIO” of the Wisconsin-based Organic Valley dairy and produce company, receives FamilyFarmed’s Good Food Business of the Year award from organization President Jim Slama at the Good Food Festival & Conference Thursday. Theresa Marquez, Organic Valley’s longtime chief marketing executive, joined Siemon for the ceremony. 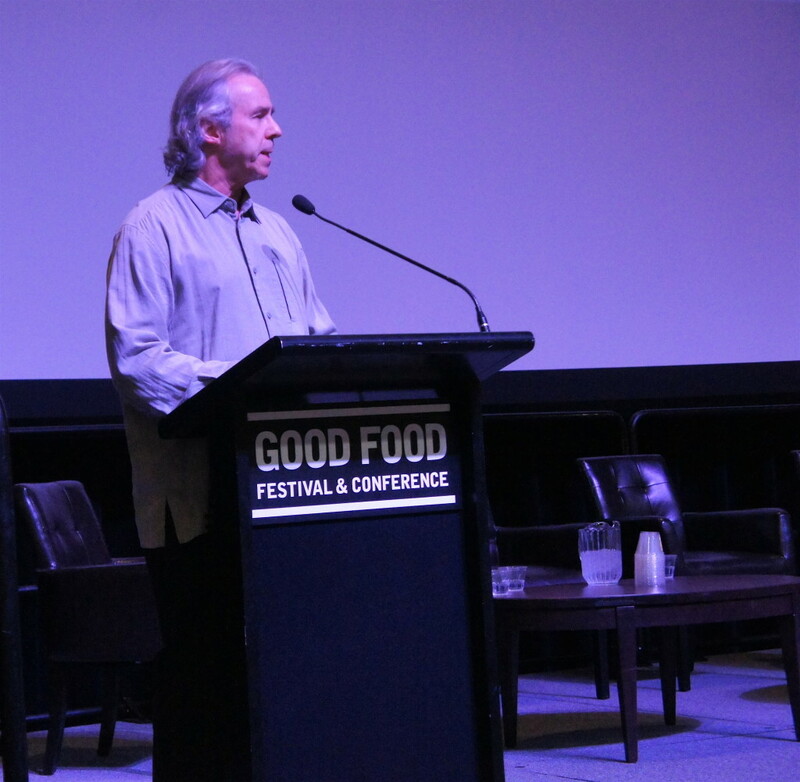 Howard Tullman, CEO of 1871, Chicago’s center for entrepreneurial innovation, discusses the incubator’s efforts to energize the region’s economy at FamilyFarmed’s Good Food Festival & Conference Thursday. Tullman hosted the organization’s first trade show in 2004 at Chicago’s Kendall College. FamilyFarmed’s Good Food Business Accelerator is located at 1871. 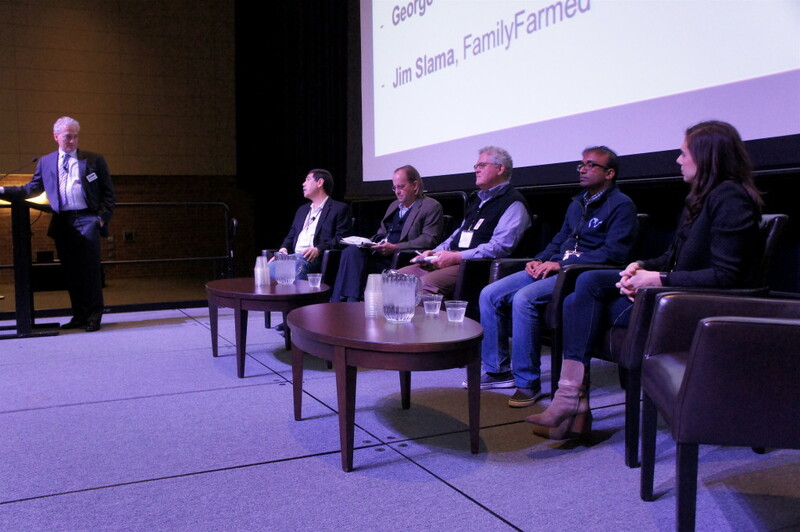 FamilyFarmed’s Good Food Financing & Innovation Conference Thursday including a panel on the organization’s effort to help Good Food businesses scale up. FamilyFarmed President Jim Slama (at podium) moderated the panel that included Liz and Tony Fiorenza (left) of Wind Ridge Herb Farm, who participate in the current class of FamilyFarmed’s Good Food Business Accelerator (GFBA); Emily Miller of Rumi Spice, one of the first businesses to receive consulting services from the organization’s Incubator Without Walls; and Daniel Caballero of Sofrito Foods LLC and Javier Haro of Food He.ro, also GFBA Fellows. This entry was posted in Good Food Business Accelerator, Good Food business development, Good Food Festivals, Good Food Financing Fair, Good Food marketing and tagged 1871, FamilyFarmed, George Siemon, Good Food Business Accelerator, Good Food Festival & Conference, Good Food Financing &Innovation Conference, Howard Tullman, Organic Valley, Tom Vilsack, U.S. Department of Agriculture, U.S. Secretary of Agriculture Tom Vilsack, USDA, Whole Foods Market. Bookmark the permalink.